A surprise dessert, great way of using up the strawberries that are too big, a bit squashly or have been frozen….a lovely way to bring a taste of summer to the table during winter months. Balsamic vinegar – a rich, dark, sweet and sour vinegar really brings out the flavour of the strawberries. Raspberries, loganberries or redcurrants make good additional fruits if you have a glut in the garden. Turn on the oven to 200C/gas 6. Cut up any strawberries that are too big and place into a shallow ovenproof dish. Sprinkle over the caster sugar and Balsamic vinegar. Place the flour into a large bowl and cut up the margarine into it. Rub together with clean, cool hands until the mixture resembles fine breadcrumbs. Mix in the sugar and oatmeal to form a crumble topping. Evenly spread the crumble over the strawberries. 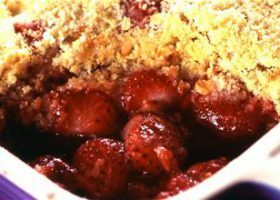 Place on a baking sheet in the oven and cook for around 30-35 mins until crumble is lightly brown and the fruit is beginning to bubble round the sides. Serve hot with cream or ice cream or cold with crème fraiche.